Contents: Preface; Introduction: The nature of the Sharia, Rudolph Peters and Peri Bearman. Part I The Historical Islamic Law: The origins of the Sharia, Knut S. VikÃ¸r; The divine sources, Herbert Berg; The schools of law, Paul R. Powers; Deriving rules of law, Robert Gleave; The judge and the mufti, Brinkley Messick; State and Sharia, Mohammad Fadel; Qanun and Sharia, BoÄŸaÃ§ A. Ergene. Part II Substantive Islamic Law: Equality before the law, Gianluca P. Parolin; Gender relations, Christina Jones-Pauly; Socio-economic justice, Hiroyuki Yanagihashi; Public order, Christian R. Lange; Constitutional authority, Andrew F. March; War and peace, Sohail H. Hashmi. Part III Islamic Law through the Prism of the Modern State: Sharia and the colonial state, Léon Buskens; Sharia and the nation state, Maurits S. Berger; The re-Islamization of legal systems, Martin Lau. Part IV Present-Day Discussions about Sharia: Sharia and finance, Abdullah Saeed; Sharia and the Muslim diaspora, Mathias Rohe; Sharia and modernity, Kristine Kalanges; Sharia and medical ethics, Birgit Krawietz; Epilogue: the normative relevance of Sharia in the modern context, Abdullahi Ahmed An-Na›im. Glossary; Index. 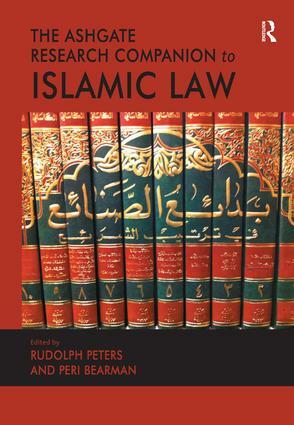 Rudolph Peters is Professor Emeritus of Law, University of Amsterdam, The Netherlands and Peri Bearman is Associate Director of the Islamic Legal Studies Program (retired), Harvard Law School, USA.